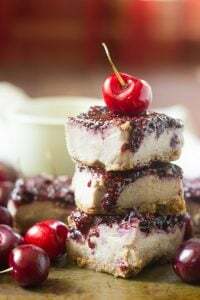 These vegan cheesecake bars are made with a walnut-date crust covered in creamy cashew cheesecake filling and topped off with a layer of sweet cherry chia jam. I love fresh cherries. They’re my favorite thing about summer! I look for excuses to eat them left and right, and they’re my favorite pre-workout snack. You know how they say eating cherries before a workout makes you less sore? Well, it’s true! But it’s something I only really do in the summer because I’m not a juice drinker and not a fan of dried or frozen cherries. So initially I had this idea that I’d make cherry breakfast bars. And then I thought maybe they could be cheesecake breakfast bars. But maybe that would be too much? Cheesecake for breakfast? I decided to ditch breakfast and make these an all out dessert! But what happened, and what’s awesome about this type of vegan dessert is this: these suckers were totally rich, sweet decadent. Dessert for sure. But when I went back and looked at the recipe I realized you could actually get away with eating them for breakfast. This dessert is made entirely from nuts, seeds and fresh cherries. Sounds like breakfastable material to me! But they don’t taste like a healthied-up dessert. We already know how luscious and decadent cashew cheesecake is. 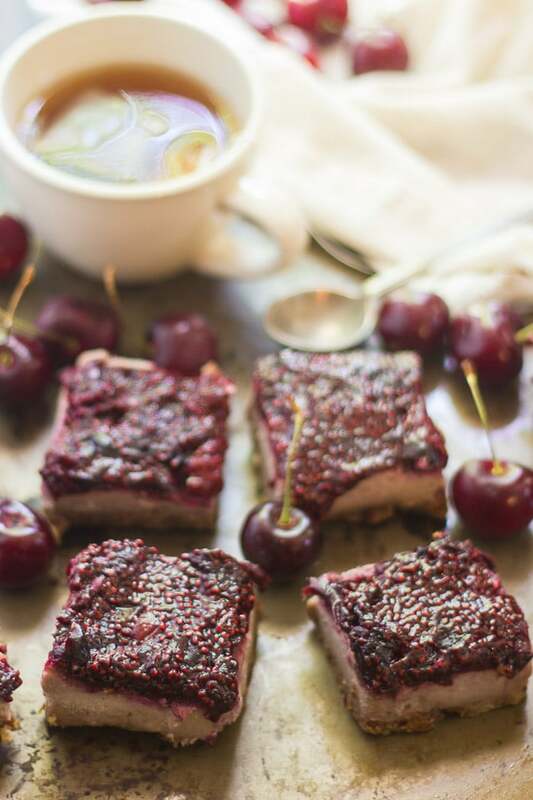 And cherries pack so much sweetness that you don’t need to add a whole lot of sweetener to make these bars desserty. Just a bit of maple syrup, and dates for the crust. For the topping, I was going to make a fresh cherry compote, and I got nervous that it wouldn’t thicken, so I dumped in a bunch of chia seeds, and ended up with, you guessed it: chia jam! So, all in all, these dessert bars are healthy by way of happy accidents. I guess we lucked out! I bet you could feed them to your omnivorous family and tell them they’re regular old cherry cheesecake and they’d love them. 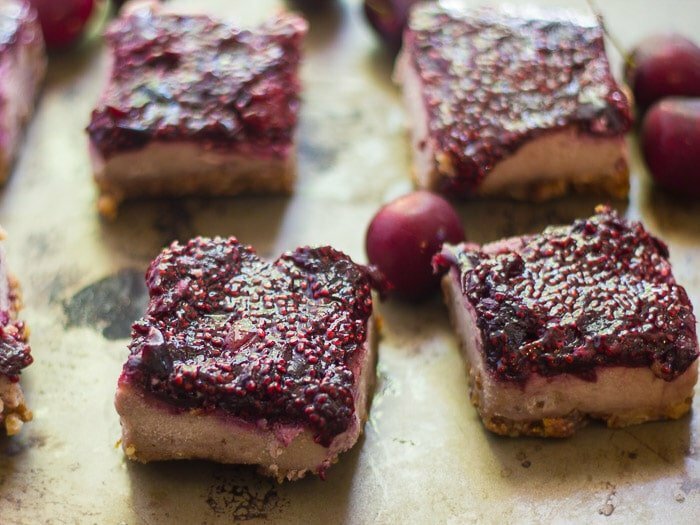 These vegan cherry cheesecake bars are made with a walnut-date crust covered in creamy cashew cheesecake filling and topped off with a layer of sweet cherry chia jam. Place all ingredients for the crust into a food processor bowl and pulse until very finely chopped and well blended. Scoop the mixture into the bottom of a 9 x 9 inch square baking pan. Press into an even layer. 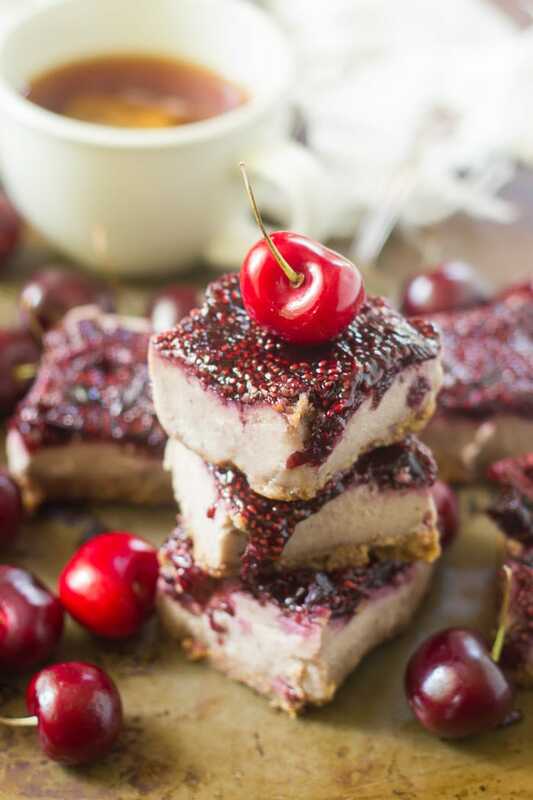 Wipe the food processor bowl clean with a damp cloth (it doesn't have to be perfect), and then add all of the ingredients for the cherry cheesecake layer. Blend until smoooth, stopping to scrape down the sides of the bowl as needed. Pour the mixture over the crust and smooth out the top with a spatula. Transfer the pan to the refrigerator and chill until fully set, at least 2 hours. While the cheesecake chills, make the chia jam topping. Place the cherries and maple syrup into a small saucepan and set over medium heat. Brign to a simmer, stirring frequently. Lower heat and continut to simmer and stir, until the cherries begin to soften, about 5 minutes. Mash the cherries lightly with a fork and stir in the chia seeds. Continute to simmer for about 8 minutes, until the cherries are very soft and falling apart. Remove from heat and allow to cool completely. The mixture will continue to thicken as it cools. When the bars are set, take them out of the fridge and spread the cherry chia jam on top. Cut into squares and serve.